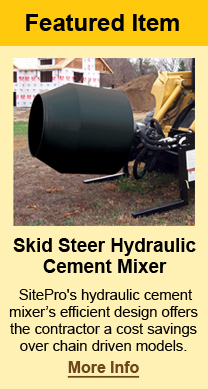 Equipment built to handle those small, yet tough jobs at construction sites. Our extensive line of front loader and skid steer attachments are quality manufactured, designed and tested. Complete with comprehensive operator manuals, SitePro® makes your next construction site attachments choice a simple one. SitePro®, from Worksaver, Inc., will be featuring its mini skid steer / compact tool carrier pallet forks, grapples and power landscape rakes at The ARA Rental Show in Booth No. 6151.